Our review of HRD diamond certification. HRD's mission is to develop Antwerp as a world diamond center by representing the diamond sector in Belgium and abroad to public governments and diamond organizations. Furthermore, they also strive to increase industry knowledge by conducting thorough research in manufacturing and trade efficiency. 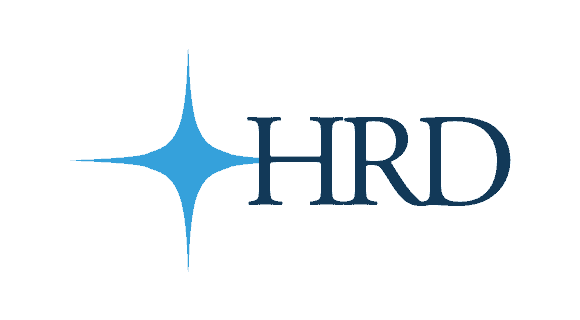 HRD stands for Hoge Raad voor Diamant, which translates into the Diamond High Council. HRD Antwerp was created as an alternative to the Gemological Institute of America in 1973. Although originally it had other functions, today it focuses on Certifying diamonds according to internationally accepted standards. Diamonds will be weighed on very precise scales ( up to 1 ten thousandths of a carat ! ). The diamond will be measured by state of the art measuring scanning machines in order to ensure maximum accuracy. The Color of a Diamond is graded on a color scale from Exceptional White to Tinted White. Each nomenclature on the color scale has a corresponding 'letter' color, ranging from D to Z. The Clarity of the diamond ranges from Loupe Clean ( Internally Flawless ) to P 3 ( Imperfect ). This is based on purity, brightness and location of the internal and external characteristics. All the inclusions and imperfections will be carefully plotted on a skeleton diagram. 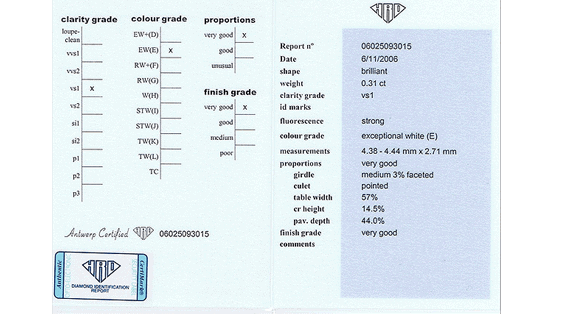 The Cut grade of the diamond ( or proportions ) is graded from Excellent, Very Good, Good to Unusual. Here a combination of the diamonds' girdle thickness, culet size, table width, crown height and pavilion depth are taken into consideration. 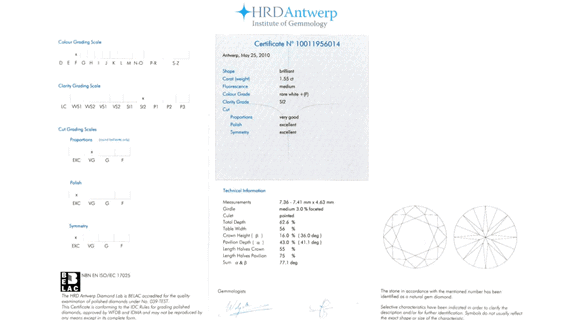 The HRD Antwerp Diamond Certificate, offered for all diamonds, certifies the stone as a genuine diamond. It also contains a detailed quality description based on the 4C's (cut, clarity, color, and carat) and includes a plotted diagram.